In the U.S.A, on the last Monday in the month of May, we take a day to remember… to remember all the men and women who have died while serving in our country’s armed forces. 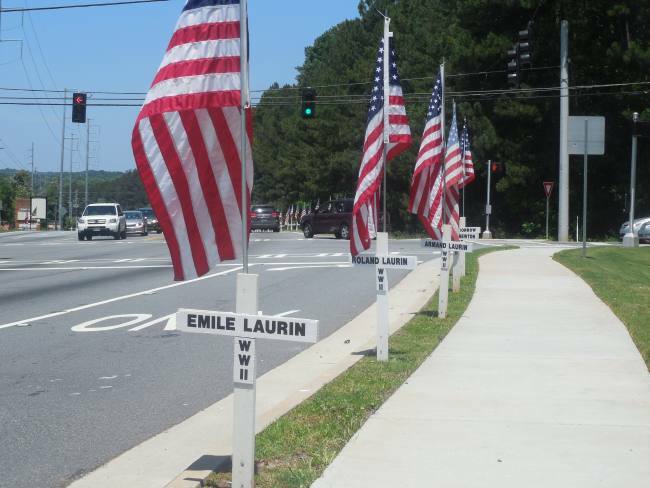 In my hometown, the week before Memorial Day, the local government stakes out on the side of main roads hundreds of white crosses, proudly flying the American flag. Each cross carries the faceless name of someone who sacrificed their hopes, their dreams, their loves, their life, and maybe even their very soul for an ideal, for a way to live, or simply because they were forced. There are souls from every major war that America has fought in: Iraq (2003); Desert Storm or Gulf War (1991); Vietnam (1955); Korean (1950); WWII (1939); and WWI (1914). I’ve even seen a few crosses with names from the Spanish-American War (1898) and, get this, one from the Civil War (1861). It’s a very nice touch, and I look forward to it every year. In celebration of Memorial Day, we gather, we picnic, we eat ribs and fried chicken, we drink soft drinks and beer, and we finish it all with celebratory sheet cakes and cupcakes frosted in red, white, and blue. Jolly times, eh?! But I can’t help wondering how many of us — especially those of us who has not lost anyone close to our heart to the soulless, ugly thief that is war — really appreciate the enormity of the losses that this day represents. During the week before Memorial Day, as I drive about town running this or that errand, I see people speeding by in their vehicles, living their lives and seeming not to notice the white crosses, the long procession of souls that have died in this or that war. There are three white crosses with the surname of Laurin. Oh, how did Mother Laurin’s heart ever bear it? Did she lose her boys all at once or one heartbreak at a time? Did she mourn too for her grand babies that would never be? What about Elmer W. Fuller, Sr.? Did the love of his life collapse even before the two uniformed, death notification officers uttered, “We regret to inform you that your husband Sargent Elmer W. Fuller, Sr. was…?” Was there a little girl or little boy waiting anxiously for daddy to come home and play? And over there are four Murphy’s. Were they the Murphy boys? Did they look alike? Were they close or did the fight like brothers sometimes do? Were they tall or short? Were their eyes light or dark? Did they have girls who dreamed dreams of them and longed for their safe return home? You may ask why fixate so on a white cross with a name. Well, let me tell you why: It seems indecent not to. I feel guilty if I don’t. Because each cross bears the name of a once upon a time someone — like me, like you. Someone whose story is forever unfinished, because they died too young, too brutally… in a war. They were once a son or a daughter, a brother or a sister, a husband or a wife, a father or a mother, or even a unfulfilled dream of love for some girl or boy, They had their own hopes, their own dreams, their own fears — and, whatever their story, enormous courage. They were here like me, like you. And now, they are just faceless names — sacrifices — on white crosses that line the streets the week before Memorial Day in some little town in the U.S.A. Please sit quietly for more than a moment, consider, and then give thanks. So today, enjoy your friends and family and the food. BUT I beg you to take a really long pause and consider our losses too: the mother or father who has lost a child; the daughter whose father will never walk her down the aisle; the son who will never know the warm, unconditional love of his mother; or the widow who must now find a new way to go on without the love of her life… and the soulless, ugly thief that is war. Call to action: Please sit quietly for more than a moment, consider, and then give thanks. Share your own thoughts of Memorial Day in the comment section. NOTE: This post was originally published on May 25, 2015. It is still relevant today as ever and it always will! < Previous Is This Our Country’s Future?! Next > How We Survive the Next 3.5 Years! My name is Kim. I wanted to say “Thank You” for recognizing the significance of Memorial Day. I recently (September 16, 2016) became a Gold Star mother. This is an “elite” group of women who never wanted to be members of this club. We are (honorably served & discharged) veterans who have lost a child or children while they were serving on active duty. This past Memorial Day weekend I slept more than I was awake. I may have never known the true significance of Memorial Day before this past one, but I can tell you with all confidence, I painfully understand the signicance today. I am not unique in this journey. As a daughter, veteran, mother and fellow American, my ❤ & prayers go out to all the families whose loved one(s) was among the fallen heroes of our American history. They too belong to an unwanted group, Families of the Fallen. Once again Janine, thank you for taking the time and effort to recognize the sacrifice this day represents. God Bless America. To say I am sorry for your tremendous loss of your child seems so inadequate. I can only imagine how difficult this Memorial Day and, most likely, all future Memorial Days will be for you. I will continue to hope for peace for all of those, who unfortunately, below to the “elite” group and for those still serving. I would love to hear any stories you would care to share about the child you lost. Please feel free to contact me on my Say Hi page. P.S. Thank you for taking the time to share this personal story here! Beautifully put. So many crosses. So many stories. A thousand books and a thousand movies could not contain the stories of our brave men and women. In my parlor hangs a picture of my mom’s brother, John Benjamin Folsom, who died a heroic death as he flew his last mission in WW 2. So young and so full of promise. I could never have imagined that my own family would experience the same grief that my dear grandparents endured these many years later. A day to remember the unforgettable. Hi, Betsy. I couldn’t agree more. Happy is a contradiction. The the willingness of those who have served and do serve our country to sacrifice their own hopes, dreams and future for the many is astonishing! I am sorry for the lost of John Benjamin. And today and every day, I mourn him and all the others who have given us the ultimate sacrifice and gift! Trump has no business even going to Arlington National Cemetery. He owes John McCain, and everyone who served as he did an apology. Thanks to all who have. No, he does NOT! And yes he does! But any apology coming from him would be a meaningless and empty one! Thanks for sharing your thoughtful post again on a day to remember give thanks to many. Only by the grace of God did I not face the choice of having to serve in the armed forces. Being born in 1960 made me an in between war baby. I believe we should all remember on this day the ultimate gift from every soldier who has fallen. Beautifully said. I am glad that you never had to choose: kill or be killed. I still hope for a world where no one ever has to make this choice. Memorial Day should be a day for reflection, as you have eloquently demonstrated, Janine. More people need to take time out to reflect…. Yes, Alton. Today is for reflection… Thanks for taking part in it. It is sad that most Americans view it as just another day off or the start of summer fun. You know, you’re right. I didn’t even think about that. Indeed, how sad! Well said. Well written. 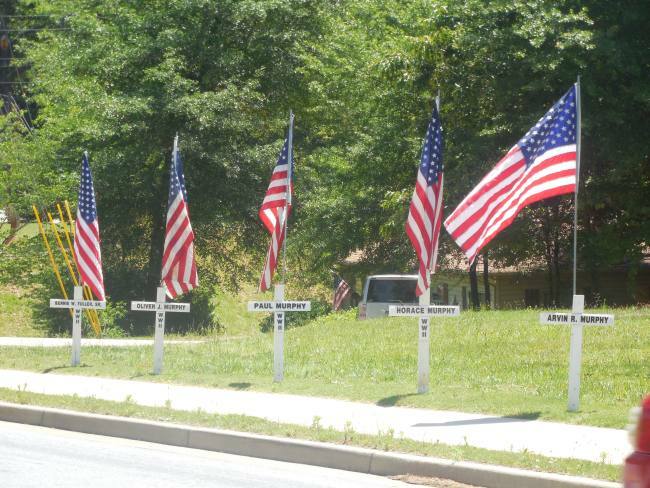 I look forward to seeing these crosses every Memorial Day too. They keep the memory alive of all the men and women who gave and sacrificed their lives so that I may live freely in America. My thoughts and prayers goes out to every family in every country in the world who have lost loved ones in this awful thing called WAR. God bless you all and thank you.